The true value of gold is reflected in the prices people are willing to pay for it. Not in the futures price one sees every day in the media. For example, the official price of gold in India is currently around $1416 per ounce. That is 96,627.77 Rupees. Yet people are forking out up to $1800 dollars per ounce. Of course the Rupee has devalued somewhat, but that does not explain the big disparity in the price. 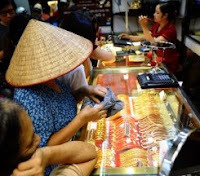 Despite government sanctions and penalties on buying and owning gold, people are still willing to pay a big margin over the top. And India is not the only country where gold is valued more highly than currency. Currently in Japan gold bullion demand is double that of 2012 and on the Tokyo Commodity Exchange (TOCOM), earlier this year, gold hit a record price of 5,081 yen per gram (equal to 1,562 dollars an ounce). In Russia there is a good understanding of the value of gold. While the gold price in Russia is 47,013 Rubles ($1419), Vladimir Putin has instituted a policy of making Russia the biggest world gold buyer and Russia is now buying up gold like there is no tomorrow. The Russian Central bank now holds well over 570 metric tones and has surpassed China in the race to own more gold. The Vladimir Lenin gold coin has jumped 400 percent this year in perceived value. In an interview with Bloomberg earlier this year, “The more gold a country has, the more sovereignty it will have if there’s a cataclysm with the dollar, the euro, the pound or any other reserve currency,” said Evgeny Fedorov, a member of Putin’s United Russia Party. Many other countries, particularly Asian and South American, are following suit and its not just Central banks, individuals and institutions are also furiously stockpiling gold. With gold starting to rise again, this is an ideal time to buy gold and start ones own little stock pile.